Living a Life That Matters Life never stops teaching. Be sure you never stop learning. 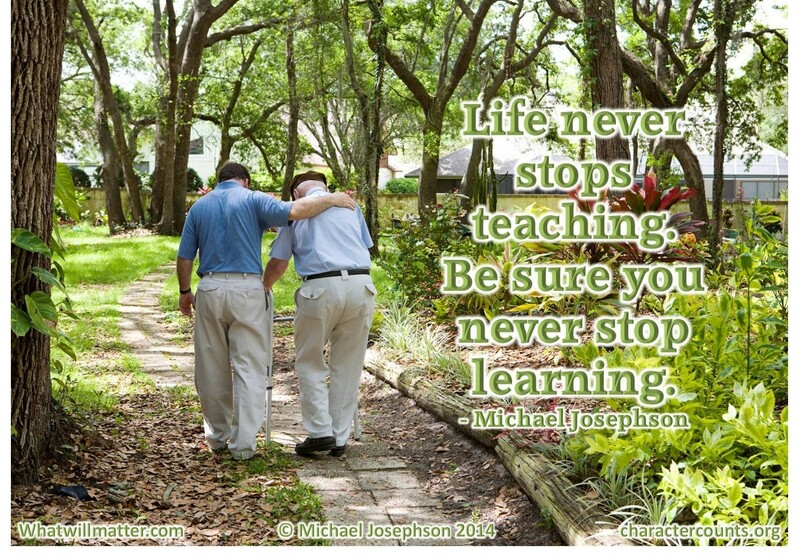 Life never stops teaching. Be sure you never stop learning. Improve your life through continuous self-conscious reflection. You’ll never stop growing if you never stop learning. As we get older life changes, we change. We can delay, but not completely avoid, physical deterioration but we can avoid stagnation and intellectual and emotional atrophy by committing ourselves to conscious and continuous learning and growth. There are lessons in every experience – the tragedies, triumphs, near misses and lost opportunities. Dedicate yourself this year not simply to losing weight, ending bad habits or dealing with chronic problems but to become smarter, wiser, more optimistic, generous and more grateful. All these things are the product of small investments in learning and honest, deep reflection. Start by really taking a few minutes, or a lot longer, to answer these questions: What did you learn this year that will help you become wiser and better? And for that matter, what did you learn last month, last week, yesterday? These aren’t questions you can answer off the top of your head. They require serious and systematic reflection, an essential quality of wisdom and the foundation stone of happiness. So before you finalize your New Year’s resolutions, consider adding a commitment to be self-consciously reflective and self-confidently humble. Self-conscious reflection is developing the habit of regularly reviewing and reconsidering life’s experiences to extract meaningful lessons. 1. What went well, and what didn’t? 2. What did I do to make things better or worse, and what could I have done better? 3. Were my attitudes and reactions to the experience what I wanted them to be? This sort of rigorous reflection doesn’t happen spontaneously. That’s why it has to be self-conscious. I confess I often don’t follow my own advice. My goal this year is to be more self-disciplined. Self-confident humility is the attitude that you don’t have to be sick to get better; an abiding belief that there is always something to learn from every experience and that being smarter or better today doesn’t mean you were inadequately smart, sensible, or virtuous yesterday. If you can’t list at least ten useful life lessons from the past year, you either haven’t thought hard enough or you may be afflicted with self-limiting arrogance, the belief that you really are as smart and good as you can or care to be.